Here is something worth spending a few minutes reading. Listing 32 innovations that may have large impacts on modern living, the New York Times mentions several green innovations that I’ve pulled out below. So plug in your shirt, finish your breakfast (that includes eating your yogurt container), and hop on your chain-less bike to start the day. The bicycle, one of the most popular and cheapest methods of transportation, is in need of a change. How else is it to compete with other methods of getting around? 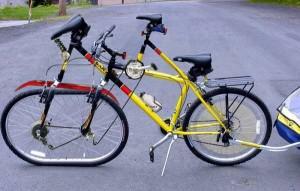 Well, by making a bearing system that allows the bike to lock, you make the bike unrideable since it can’t be steered. The lock is inside, so the only way to unlock it is to destroy the bike, which makes a for a pretty good disincentive to steal. Another innovation has to do with the ever-present and greasy chain. Currently popular in China, bikes with drive shafts including an internal gear system will replace the need for chains. Finally, what about leaving your bike out in the rain or lugging it up stairs? How about thermoplastics? These materials are lighter, cheaper, and don’t rust. They will be ready to hit the market soon. (This is a personal favorite of mine.) Harvard bioengineer David Edwards says, “We’ve got to package in the same way nature does.” How do we do that? Well, he thinks through designing containers and films he calls Wikicells. The New York Times describes it this way. Yogurt will be encased in a strawberry pouch, for instance. You could wash and eat the packaging, like the skin of an apple, or you could toss it, like the peel of an orange, since it’s biodegradable. The newly wrapped ice cream and yogurt will be available later this month at the lab store in Paris, with juice and tea coming within the next year or two.